I live next to a hospital complex; more accurately, next to a mortuary. I find that appropriate because I might be a zombie, considering that I shun daylight and only get any work done at nighttime. 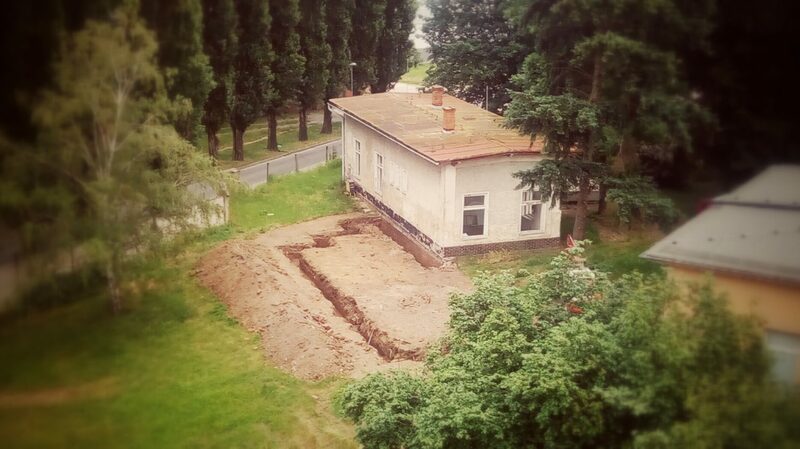 Today I woke up to find the mortuary under reconstruction. While I was sleeping, which was a significant part of other people’s workday, what looked like the foundations of an amusement maze were dug up behind the building. I figure that zombies want to have some fun too. On a related note, my landlord might have become zombified too. I wonder if it’s a cause for concern or joy, since as an undead person, he might resign at earthly possessions and stop demanding that I pay my rent. What leads me to doubt his live status is that he started to keep the lights on in his house throughout the night. I know because I’m so unfortunate as to have my landlord living across the street. We spy on each other because our windows are facing, which makes random sightings hard to avoid. I monitor my surroundings religiously about once an hour, when I go out on the terrace to smoke. So, unless smoking kills me first, I shall keep you posted about further developments regarding the zombie amusement arcade being built under my windows (I live in a bedsit but I have two windows, which is cool, right?) and regarding the possible zombie threat across the street. This is such a great neighbourhood to live in. It’s really lively here, you know. Haha I constantly assess my living environment and rate my chances of survival in case of a zombie apocalypse. My current abode is distinctly indefensible. I’m not a zombie in disguise, I came out and am now openly a zombie 😉 Reading your scenario, I also hope we won’t meet. I wouldn’t escape alive. As long as a zombie is alive. It’s mind bogging. Same to you! Minus the zombies, of course. That’s too funny … lively mortuary! Must be some oxymoron. Wonder what’s up with your landlord?! He suffers from insomnia, perhaps he’s haunted by thoughts of charging you too much rent 😸 Time will tell. Here, all the zombies go to the coffeeshop. If I get up, sometimes, between 3 o’clock and 4 … there’s always a whole line-up of cars there. It’s a 24/7/365 kind of coffeeshop. Sounds like a fun read! No zombies yet though? What an omission on the part of the author! It’s the Sookie Stackhouse series. It was made into a TV series called True Blood. Got just about everything else except zombies ! I’m impressed the mortuary is outside. In the hospitals where I work, it’s always on the same floor as the staff cafeteria. A bit awkward if you turn the wrong way getting out of the lift. Looks like a country area, not city. Kinda creepy the landlord can spy on you! Haha 😀 Actually, not anymore, they’ve turned the morgue into a construction site and there’s always noise and drilling these days. Haha 😀 Yep. Literally. So far it looks like the morgue building is being expanded, but it’s hard to tell yet. It is. I’m considering taking a time-lapse photo series of the construction. Because I can. Your post made me laugh. Thanks. You’re welcome and thanks for your lovely comment!